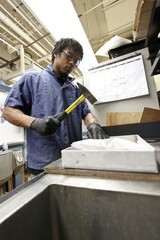 A laboratory technician uses a hammer to smash frozen natural product materials into smaller pieces to prepare them for the grinder. Some pieces are stored into smaller bags for identification. Technicians sort and grind natural product samples kept by the National Cancer Institute's Natural Products Branch at the Frederick National Laboratory for Cancer Research. NCI has the largest program to collect materials worldwide from marine, plant, and microbial sources so they may be studied for possible medical uses.